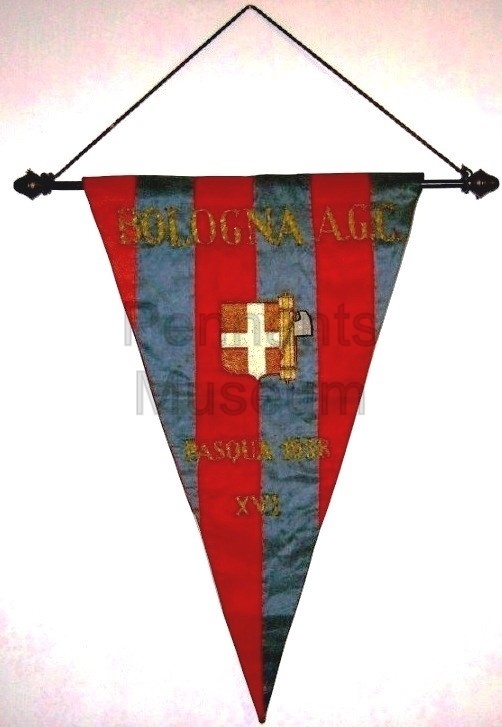 This extremely rare pennant was issued by the Italian team BOLOGNA in occasion of the Easter 1938. It were probably presented to the club staff member for the Easter holiday. It shows name of the club BOLOGNA AGC where acronyms stands for Associazione Gioco Calcio name that Bologna got in the season 1934 – 35. Badge in the middle of the pennant represent the Italian royal family badge (the Savoia shield with white cross on red background) together wth the fascio littorio badge that were used during the fascism era. This badge (the Savoia shield with the fascio littorio) was also on the shirt of the winners of the Italian league starting from season 1927 – 28 up to 1942 – 43 season. 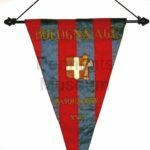 Pennant is a large one (it measures around 40 x 50 cm) with lettering all embroidered in gold thread and badge with an outstanding hand made embroidery normally for that age. It is one of the rare pennants of my collection due to the fact it was issued in a few samples and not for a match but for the club staff members only. Back of the pennant has the Italian flag while cord and brass pole are not the original one even if those in picture have been taken from another pennant of the same age.